Following our last piece of bespoke tailoring to be analysed in this series – Ferdinando Caraceni in Milan – we now turn to the most famous of the Florentine tailors: Liverano & Liverano. Liverano has received such attention in recent years that this style will be familiar to many. Its most distinctive features are an extended shoulder, a wide lapel that is cut straight (so it appears to roll inwards) and a relatively high buttoning point. All three combine to give emphasis to the top of the body. That is reinforced in the lower half, with a shorter jacket than most outside Naples, and quite open, curved fronts (below the waist button). It’s curvy, open but strong. The jacket was made and cut for me by Antonio Liverano, during a trunk show in London (though he sadly no longer visits). I then had subsequent fittings in Florence. I would never, ever have picked this material if Antonio hadn’t recommended it. The cloth was dead stock, and something he clearly loved. It is a bright purple woollen, with a pronounced twill. Others I know have had a similar experience. Antonio has such a passion for cloth, and interest in colour, that they trust him with unusual choices. In my case, the colour has certainly worked out. I love wearing the jacket, and I’ve never seen anyone else wear anything like it. However, it is pretty restrictive. The only way I really like wearing it is with dark-grey trousers, dark-brown shoes, and a blue shirt, either open-necked or with a navy tie. So not the most versatile piece in the wardrobe, and certainly not something to commission until you’re a long way into your sartorial journey. But it’s never been a choice I regretted. In the front-on image at the top of this post, that distinctive cut with the extended shoulders and wide lapel is plainly evident. However, the shoulders are actually not as wide as they appear. They measure 6½ inches along the shoulder seam, from where it joins the collar to the end at the sleevehead. 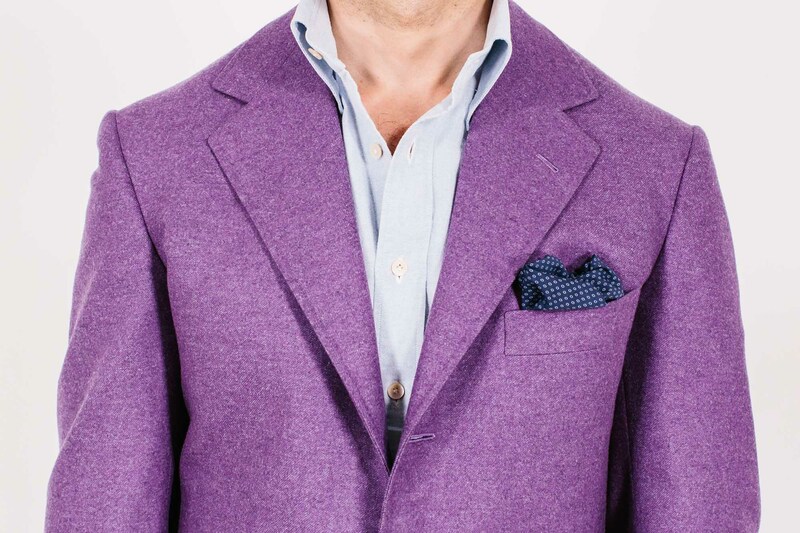 I think the Liverano looks wide, however, because of the rather short, wide, square lapels – and because of the second point above, that the jacket is short and the buttoning point high. In fact, the buttoning point (18 inches from shoulder seam to waist button) is the highest of all of the suits we’ve looked at in the series. The lapel also looks wider itself because it is so short and square. It measures 3¾ inches across, which is wide, but the same as both Caraceni and Anderson & Sheppard. The difference is that the roll only really starts around the top button (see image above), making it shorter. And it’s a straight lapel, making it thinner than anything English (which will usually curve outwards). There’s also a very subtle point at work here. The cutter I work with to analyse these suits pointed out that the notch in the lapel is almost a perfect right angle. This is a small point, but I’m sure it adds to the impression that the shoulder is wide and square (despite actually only having thin padding). That tailor (who would rather remain anonymous) was also very enthusiastic about the finishing. Everything is just very precise. That’s not an easy thing to communicate about a jacket. It’s certainly harder to talk about than Parisian top stitching or buttonholes, for example. But it’s often the kind of thing a tailor will most admire: not more work, but better-executed work. Jettings on pockets that are precise and identical; finishing around internal pockets that is sharp and exact. That extends, of course, to the making aspect Liverano is best known for: the single dart in the waist of the jacket, which curves forwards into the hip pocket and stops there, leaving everything below clean and seamless. How easy or useful such a construction is depends on the customer’s shape. But it’s nearly always harder than using two seams, as every other jacket we’ve featured in this series has. It’s also something a lot of tailors can do. Panico, for instance, did it on his suit for me just because he thought it was ‘more English’, even though he wouldn’t normally. Tailors just generally don’t because it’s harder – and having that lower part of the jacket clean is not seen as a priority. I entirely understand customers who think it’s beautiful, and those that think it’s irrelevant. Elsewhere on the jacket, there is a little drape in the chest, but not much. More than other Italians or French. The armhole is particularly high. The sleeve and cuff are pretty standard: not as slim as the French or most Neapolitans. The pockets are interesting. The welt of the outbreast pocket is deeper than most, at 1¼ inches, while the flaps on the hip pockets are small, barely 2 inches. It’s hard not to see one more thing that adds weight to the top half of the jacket. On the finishing, it should also be noted that the seams are top stitched all around the jacket, and the edges swelled by stitching that is a ¼ inch from the edge. Both give an impression of thickness to the lines of jacket, and casualness that would be more relevant were the cloth not so overpowering. As ever, the articles in this series are not intended to discuss fit, or the images intended to show it accurately. The chest is a good, clean fit, for example, despite a couple of stray wrinkles in the front-on shots. The pitch is also good, despite what the sleeves might suggest above. One thing that is true, however, is that those high armholes are catching me, and could have been lower. The trousers shown with the jacket were not made by Liverano, but by Luxire in Crispaire 337051 (9/10 ounce). The shirt is made by Luca Avitabile in Permanent Style Oxford fabric, and the spotted silk handkerchief is from Anderson & Sheppard. 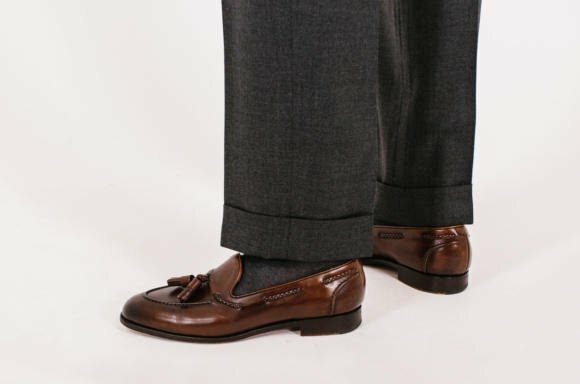 The loafers are the Belgravia model from Edward Green, with EG’s distinctive burnishing on the toes and heels. The trousers are being held up to better show the loafers off; they’re not actually that short. For more articles in this series, see menu at the top right (or below on a mobile device). Also available here. 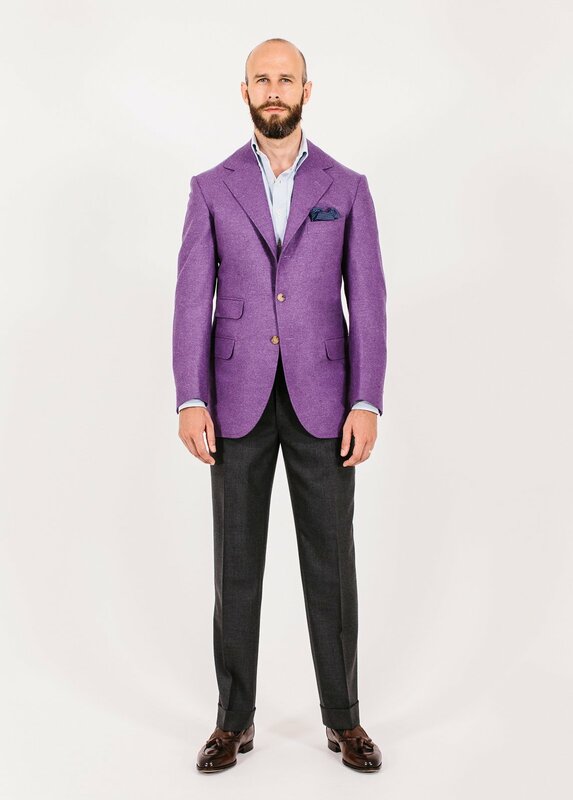 You can follow the discussion on Liverano & Liverano purple jacket: Style Breakdown by entering your email address in the box below. You will then receive an email every time a new comment is added. These will also contain a link to a page where you can stop the alerts, and remove all of your related data from the site. Interesting article. Do you plan on doing one for Cifonelli in this series? The Jacket is beautiful. The profile shot shows how well it fits you. Seems like a great choice for the holidays. I have 2 Liverano suits and love them. I have a sport coat and grey chalk stripe suit in the works. I too with with what Antonio recommended. Why the rather uneven placement of the sleeve buttons as shown in the sideview? They’re not uneven really – it’s just that the second and third have moved a little along the buttonhole and the top one has not, because that buttonhole is not open. Few can create a more elegant and beautiful tailored garment than Sig. Liverano. Yes, it’s expensive, as pointed out; but there is little doubt that the “snob factor” is at play here and its high cost and exclusivity is the very thing that attracts many to luxury items like this. The Liverano house has managed to produce something that is not easily copied and his clients have happily accepted his monetary capitalization of his skills. Is the jacket padded as you note or it there significant wadding at the end of the shoulders? The Liverano experience is unique. Antonio picks out your fabric based on a skillful analysis of your “person”, measures you and tells you thank you and he’ll see you in a few months. His services are accompanied by no discussion about what buttons you want and the length of your jacket. He is very polite and pleasant, but the experience is quite different from many other houses. Thanks Jackson. The shoulders have a thin pad with a little sleeve wadding in the sleeve head. But nothing significant. Hahahaha….sure, Simon, whatever you say…Every Liverano client walks away saying that while he chose nothing directly, he was “very happy with Antonio’s suggestions.” And I do believe it’s the truth in all cases as Antonio is nothing short of brilliant. 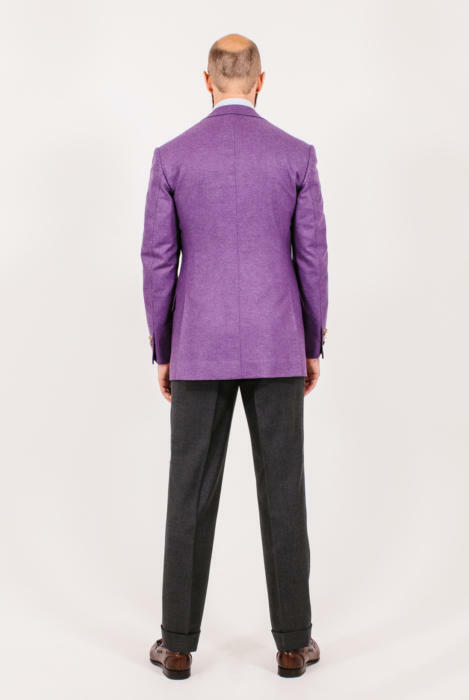 But think about it; he chose the fabric, the color, buttons and length, lapel width, and padding level. Any decision-making with Antonio is mere chimera; it is hoped for and, indeed, felt, but it doesn’t truly exist. A buttonhole on a sleeve is either “working” or “sham”. “Open” or “closed” are not correct descriptions. Sham is another word for false. I would imagine the majority of people know that. I do apologise for going a little off the intended topic of evaluating the tailor and the garment itself, just venting! I do agree James, it’s hard when comparing this to other tailors. The only thing I can really say is that bespoke remains good value generally. The best example I have there is one well-known tailor that also makes for customers of a designer brand. The brand sells it for a 40% higher price than the tailor, and that does actually fit with the brand’s other pricing – given what it charges for RTW etc. So at least you’re not paying that. Hi James, I feel your pain! However, I would add to Simon’s reply by saying that there are two other factors at work here. The first is demand – as the order book grows, grand tailors like Liverano often don’t expand like other businesses might, but rather use price increases to control order flow. Their staff are highly skilled and they sometimes feel that expanding would impact quality. The second is the artist factor – the ‘creative inspiration’ of the tailor rather than just the sum of the raw materials is reflected in the end price. Grand tailors (mostly correctly) believe that their input into the process has a value – Liverano might be compared with Rossetti, Rubens, Rothko, etc., depending on your taste! I agree that the tailoring inflation rate over the last few years has been rapid, but this has also been mirrored in other luxury handmade products like watches. Finally I would just add that in my experience customer loyalty is rewarded by many tailors – my current SR tailor gives me a discount on their standard prices based on my regular orders. I’m 99.9% The Armoury’s involvement has something to do with it. Especially considering the fact that the Armoury’s prices for L&L are significantly higher than what Simon published here for a 2 piece suit ($7200 vs €5730). people who shop at armoury are people who need someone else to guide them how to dress, so that’s the price they pay. Very interesting post, Simon. Although I’d never wear a colour like this, I have to say that it’s a beautiful jacket and it looks good on you. I tend to prefer the straight cut to the lapels that many European tailors employ, as illustrated here, compared to the more rounded, belly lapels of UK tailoring. Are you aware of any British tailors that cut lapels in a similar way? Would it be a good idea to ask a UK tailor to cut lapels in this way or would you advise against it? No I don’t to be honest. And it’s something I’d be nervous about asking them – it’s not easy to describe or define, and even if they could precisely copy what someone else had done, it might be a little insulting to ask them to change such an artistic part of the garment. Thanks, Simon. I thought that would probably be the case. Seems like a jacket that would certainly turn heads anywhere you go, Simon. 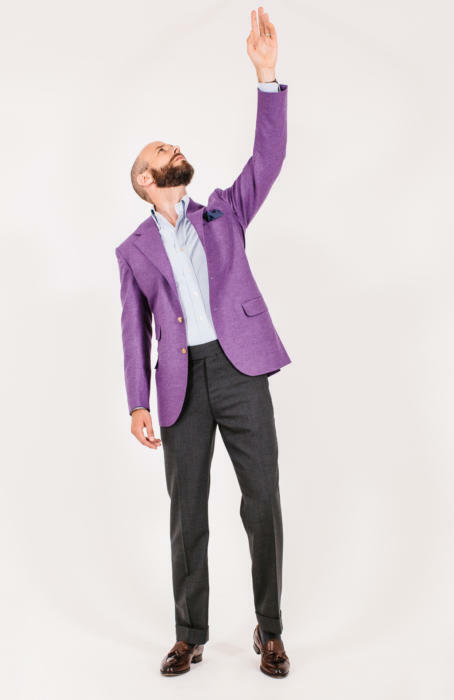 Which begs the question, how would a peak lapel look on this jacket? And if one is feeling even more adventurous, why not make it a three-roll-two, with such a beautiful roll? I can see the attraction of a peak, but if anything it’s nice to tone down everything else? It is a three roll two, just a very high one! Interesting article. I actually wanted to raise a couple of points about the trousers. I recall that you once advised that black shoes should be worn with charcoal grey trousers. Is that still your view ? The trousers you are wearing look close to charcoal ?Secondly ( I am having 2 pairs of bespoke trousers made ) have you ever considered wearing braces? I understand that this provides a more precise break across the shoes. I think its perfectly fine to wear chestnut brown or brown suede shoes with charcoal, be if flannel or worsted. Hi Simon…..I take it you have been using Luxire further to your recent review, any notable points of interest, such as any improvement in hardwear? Do you find it hard to maintain the lapel roll? Other examples of the Liverano cut that I have seen tend to have flatter lapels after a while. Sorry, but l thought the idea of bespoke was that it compensated for the wearer’s imperfections. This seems to emphasise them. Simon, your pants especially in the last photo are at least a half inch short poss. 3/4 too short. You need a slight break . Given the choice for dark trousers (and obviously shoes), are the buttons not too light? Darker buttons (grey, brown for a more casual look) would have provided sufficient contrast with the cloth and match the rest. I have a jacket in similar colour and cut though in cord. It is flamboyant and I am interested in the type of uses you put it to. Evening drinks events etc.? Some interesting points about value. Beautiful fabric aside the price is only good value if you want this particular (albeit precise) cut (and yet it doesn’t quite fit in the sleeve head – too tight). The lapel notch and line is visually high and the shoulders are fully emphasised (not unusual in Italian cuts) – the wider shoulders support this aesthetic. Ordinarily this would flatten and de-emphasise the chest but the utilisation of the very rolled lapel pushes the chest out and counter-balances this. The roll and high button point also lift attention away from the waist, which, if the jacket fronts were longer, would look too high and the length too long. I agree with another comment that use and cleaning/pressing may flatten the rolls over time. Italy being, perhaps, too far to go just for the house pressing style. You mention a single dart in the waist but with no illustration but we do have an image of you pointing to the ceiling. I think it also worth mentioning that readers might be interested in viewing some of the inner jacket work as it can often display levels of finishing (being as it is hidden). P.S. The sentence ‘That is reinforced’ doesn’t make sense (para four)? I meant that the emphasis on the top of the body is increased by the cut of the lower half. Thanks on the other points. Yes, it is mostly events, evening or just a nice lunch if open necked. Really great piece. The waist suppression, open quarters and slightly roped shoulders make up for the high buttoning point and lapel roll and minimizes their tendency to shrink the chest (e.g. your Caraceni). The cloth reflects light and holds shape beautifully, though is no doubt flashy (so I agree with the trouser pairing). The back is also beautifully proportioned. It’s a small point but I may have gone for darker buttons and worn the jacket exclusively with black shoes. First, can you explain what you mean by “square lapels”? Does it mean that the angle where the line of the lapel turns into the notch/gorge is close to 90 degrees? 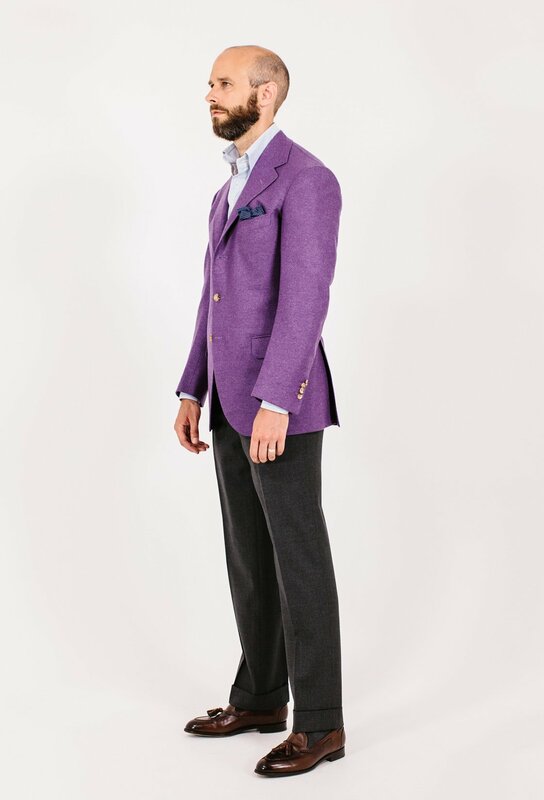 Second, on a question of style, with a very unusual colour like this which would imply casualness, do you think having a relatively smart styling elsewhere (strong and square lapel, defined shoulder, flap pockets, nice finishings, etc.) balance out the unconventional/casual colour. I’m feeling the simplicity and sharpness of the rest of the styling is why the unusual colour works. If you don’t mind would you name 3 occasions when you wore this jacket with and without tie? This is what I’d wear were I ever invited to a hen party. Is the liverano cut representative of the Florentine style? Do other Florentine tailors give a similar cut e.g Kotoro? Kotoro combines different styles, but there are elements of it in there yes. Hi Simon, what about Shibumi in terms of styling? How florentine are they? Have you had any tailoring made by them? How would you rate them? Actually my question went to Mr Crompton. Interesting how the shoulders really looks padded and somewhat British (to my non-British eyes) with such minimal padding. Perhaps the best of both worlds, you get the strong look of the British cut in the feel of the soft Italian cut? Comparing this to the Liverano jackets of The Armoury crew, I can’t say their shoulders looks the same, but I’d assume Antonio only does the house cut? Aside from the brave material choice, the cut is interesting. I’m struggling to find the right words to describe it, but this coat appears to emphasise the upper trapezius. Is the collar a bit higher than usual? The effect (shoulder strongly sloping) is one I have noticed on a number of your coats (although not so much with eg the Richard Anderson), but it seems more pronounced here. Simon do you always stand with your hands/arms so far forward? It looks very unnatural and must be a swine when it comes to getting the pitch right. I need to be honest. The color of that jacket makes it largely unwearable for 99% of all occasions where jackets are appropriate. It’s transcending into peacock territory . is a square/right angle at the shoulder recommended, whatever the shoulder slope? Not sure l understand this question Gonzague. G. Fischer’s point about being unwearable, though honest, reflects on the modern appreciation of style and what can be worn. The jacket isn’t the problem, the lack of situations wherein people can dress this way is. Tangentially, as Liverano are Florentine and, as such, with a presumably Florentine aesthetic do you think that the colour would be less flamboyant (read more wearable) in its native surrounding than in the greyer light of the UK? Style is subjective after all. This jacket is perfect for someone who has all the basic stuff and wants to continue the sartorial journey in a meaningful way, keeping in mind that business and many other places that used to be formal are now becoming more casual by the day. It’s also the perfect jacket for holiday and other cocktail parties, theatre dates, a Saturday luncheon or dinner date, a Sunday brunch, a child’s performance recital, a ballet performance, comedy club or other live entertainment show, a lecture series attendance, a concert, a book review talk, a Sunday afternoon stroll with the dearest, etc. It’s smart casual and there are many places for it. Also, we should also temper our own market sensitivities with the acknowledgment that £5000 for one man is £300 to another and it’s no more “ridiculous” for some to purchase this exact jacket than it is for others to have more than a few pair of shoes or eating dinner out several times a week. So let’s suspense with the backhanded compliments. My compliment wasn’t back handed, apologies to anyone and Simon that thought it was. I, for the most part Mr. Hart, actually agree with you. With respect Jackson your long list of events and the sartorial register therein may be idiosyncratic to geographic location and cultural milieu. Thus it may not translate into other realms. Oddly, despite the wealth here, Londoners generally tend to dress down rather than up (patrician modesty perhaps?). ‘Point taken, Anonymous. However, I lived in London for four years and Cambridge for two. While the aristocratic veneer of nobility affects those old fogeys left over from days past of dark smelly wood and fussy and strict social and dress codes, many of the younger and hipper have long ago rejected the bowlers and oxfords as a uniform of blue-bloodedness – black from head to foot – in favor of individual, yet classic styling. Paired correctly with toned-down items, there are plenty of places this beautiful and tasteful jacket works in New York, London as well as any culturally urban environment. ‘Give it a chance? Hi Simon, just wanted to ask, what’s your opinion on Milanese buttonholes? Do you request them on all of your jackets? I think they’re lovely, and I would usually have them on a jacket from any tailor that offered them. Most don’t, however. A well worked Milanese is a thing of beauty. Bit of a dying art though. Getting the silk is not getting any easier either. I think the increasing rarity makes them seem even more special. I thought they were more mainstream than that, kind of a Pitti thing. And true I also saw a lot of them in Asia, including a very beautiful, neatly made one on a Korean friend’s jacket. So, Simon, I can assume one shouldn’t look for a Milanese to assess the quality of a jacket? Do you usually ask your tailors if they offer them? Do your Neapolitan jackets have them? No, it’s a nice touch but it’s only one aspect of the quality, and a pretty small one at that. A machine made Milanese?? How awful. Of course you would never look for a Milanese to assess the quality of a jacket. All a Milanese could ever do is give you a clue to the skill level of the finisher. Working a proper Milanese takes skill and time. 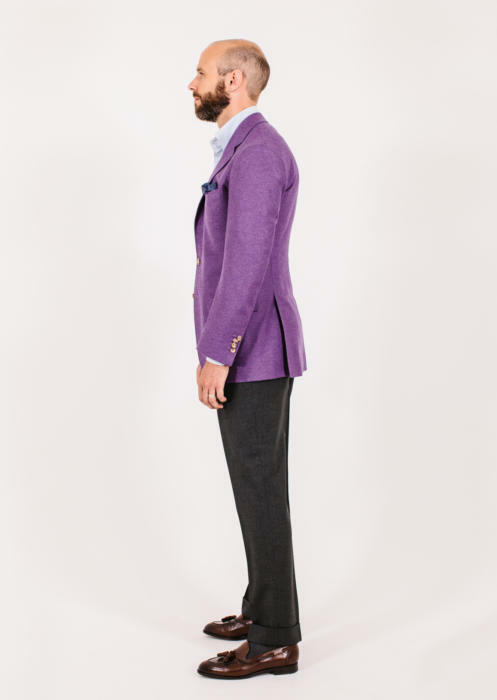 I have a suede blazer of similar colour which my colleagues uncharitably call my Willy Wonka jacket. I wear mine with a white shirt channeling Nick Wooster (https://www.pinterest.co.uk/pin/160440805448177333/), and according to these photos, now you! I think it is great with a bashed up pair of once-smart indigo jeans and shoes. That’s a beautiful purple. I see it matching well with a lighter colored trouser though such as white or light blue or a pinstripe mix of those two. However, I assume it is a heavier fabric and hence the white trouser might clash a bit as white is normally worn for warmer weather or summer months and darker colors are for colder or winter months. But then again it’s really up to who’s wearing it. I would pair it with white trousers. Looks great though. Hi Simon, beautiful jacket. What are your thoughts on the line of RTW that Liverano is selling through the Armoury? Can one justify the price in order to get the Liverano style given the garments are hand made and finished? Thanks. Will double check. Quick question on the trousers as I am looking for a pair like this. I understand it is a 9/10oz crispaire, would you say this can be used 3/4 of the year? This is by far the best piece I’ve seen so far on this website. The color, the cut, the material … an absolute beauty! Having said that, I wonder why did you choose that color for the trouser? I know you probably wanted to tone it down, but that dark trouser really killed all the fun. I am not in a position to advise you on anything related to style, but I would have chosen to wear it with a much lighter color ( a lighter tone of grey or even white during warm and sunny days). Anyway, that jacket is pure art. Lucky you!